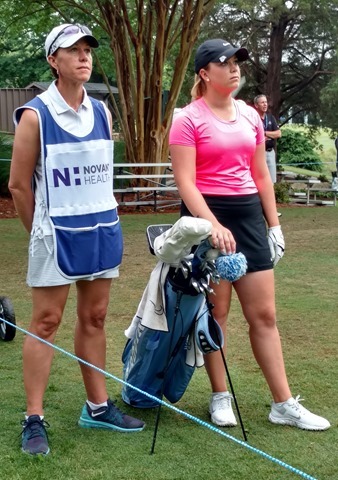 Suzy Whaley is looping for her daughter Kelly this week at the Symetra event in Charlotte. Raintree Country Club, one of the hilliest tracks on the Symetra Tour, is not the place to break in your caddie legs. To Suzy’s credit, she offered to go around again in the afternoon for a friend if needed. Kelly received an exemption given she is a Tar Heel favorite. Billy Prentice is working for Kendall Dye and got to play along with his pro-am group on Wednesday. They were two players short and permission was given to join in. Finished –15. “Chocolate Chip” (or “Lemon Drop”, if you prefer) Wall is on Kristy McPherson’s sack this week. Chad is also here looping for Silvia Cavalleri. JiSoo Park was +16 with three to play. Mercifully WD’d. This entry was posted on Friday, May 13th, 2016 at 2:59 pm and is filed under Uncategorized. You can follow any responses to this entry through the RSS 2.0 feed. You can leave a response, or trackback from your own site.